Mass Confusion is a Terror Witch Doctor skill unlocked at level 22. It confuses enemies, causing them to fight for the Witch Doctor for a limited time. The point of the skill is not to get the damage the monsters deal, it's to stop some monsters from attacking the Witch Doctor. Monsters can be hit and damaged while they are confused, and this skill is useful to use even when there's only one monster around, since it will stop fighting back and simply stand there if confused. The Witch Doctor gets into the mind of his enemies, making it hard to differentiate between friend and foe. Confused monsters will fight on the side of the heroes, for a limited time. They can also be attacked, damaged, and killed even while confused. Refer to the Mass Confusion rune effects article for a thorough description of the five rune effects in this skill, including screenshots, videos, and strategy tips. A very good skill against tough mobs, making them fight with each other whilst the Witch Doctor takes care of them from afar. However, it is unknown if there will be specific mobs who are immune to this skill, but we do know bosses won't be affected. Furthermore, it can be possible to convert a powerful creature to take care of the smaller yet still dangerous minions, ones that the Witch Doctor cannot take care of himself. A video of Mass Confusion in use can be seen below, courtesy of the DiabloInc Youtube channel. 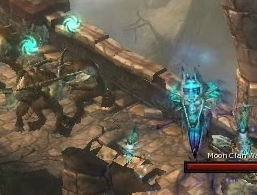 Mass Confusion was introduced in the WWI 2008 gameplay video when Diablo III debuted. This skill started out in the Spirit Skill Tree, and stayed there until skill trees were removed, when it became a Tier 6 skill. Skill tiers were removed shortly before the beta started in September 2011, and Mass Confusion became a level 23 skill. When the skill system was once again overhauled for the Beta Patch 13 in February 2012, Mass Confusion was classified as a Terror skill and moved to level 26. For March's Beta Patch 14, Mass Confusion was moved to level 22. Mass Confusion has, throughout development, been too high-level to play, so there are no gameplay reports describing it. See the Witch Doctor skill archive for more details on previous versions of Mass Confusion and other Witch Doctor skills. This page was last edited on 7 June 2012, at 00:27.